Amazingly this is the fourth beer in a row from Red Duck to feature in the Great Beer Styles section of the blog. I'm labelling this beer as an Unblended Lambic, while Red Duck are calling it a Belgian Lambic Golden Ale. In short no one really knows what style this beer is, so the only thing we can go is try it! Before I get to try it however, we have to discuss the provenance of this beer. The other half of this brewing collaboration was Anders Kissmeyer (formerly of Nørrebro Bryghus and now his self-named brewery Kissmeyer.) He's a Danish brewer and almost every beer he touches seem to turn to gold! Hopefully he has managed to harness Red Duck's craziness into a really interesting beer. The colour of the beer is an almost luminous orange colour. For such a light coloured beer it is extremely opaque and there appears to be a fair amount of sediment. It's got a 2 finger of fast dissipating oranged tinged head, which leaves almost no lacing. It's quite refreshing to see a Red Duck beer with a head! 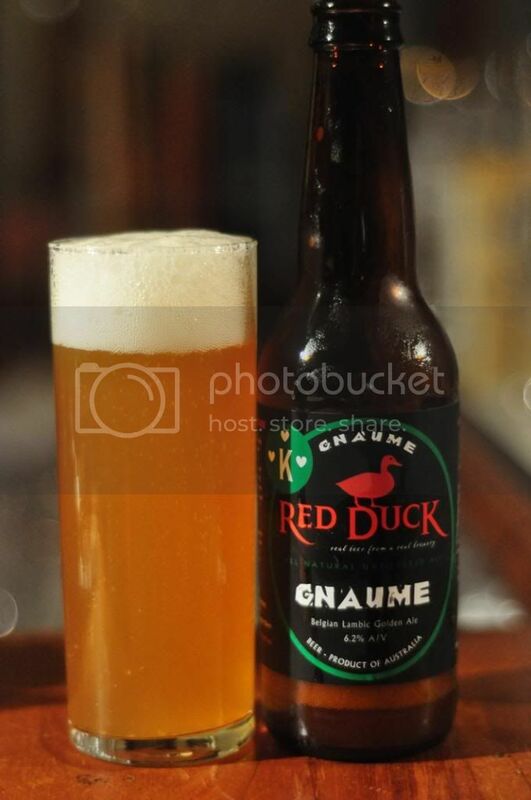 Well to me the most noticeable element on the nose of Red Duck's Gnaume is the Brett yeast. As this is a Lambic that's a good thing and not as many reviews I've read about this beer have said, a bad thing. It's a Belgian Lambic of course it should have Brett in it! Anyway besides the Brett aroma, there is a fair bit of sweet apple flavour and some floral notes which seem quite nice. Red Duck's Gnaume does not taste at all like what I expected after smelling it. For some reason the brewers went down a slightly more malty route than would be expected for the style. There are hints of lemon and Brett as the beer warms but nowhere near as much as would have been expected. Look the real winner for me was the mouthfeel, lots of small carbonation bubbles tickle the tongue before a nice dry finish takes over. There's definitely something to work with here if they were to give this beer another crack! The moral of the story with this beer is that you really need to understand the style in order to like it. Gnaume is certainly not a beer I would recommend to beer novices or even beer people who don't appreciate Belgian beers. The beer is by no means perfect but you have to give Red Duck props for brewing a genuine Lambic in Australia. I don't think there's many brewers in Australia who can claim to have done that!